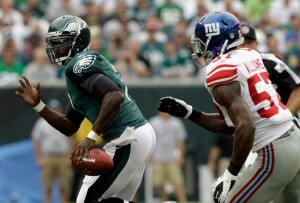 Michael Vick Exited In The Fourth Quarter With A Reported Broken Hand.. 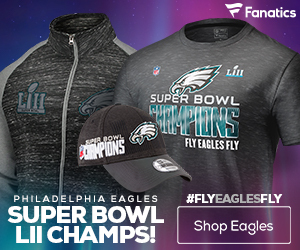 The Philadelphia Eagles were looking to jump to an early NFC East division lead in their home opener, by beating the New York Giants in an early week three match-up. The Eagles were coming off a heartbreaking loss to the Falcons, and the Giants off a win against the Rams on Monday Night Football. After sustaining a concussion last week, Michael Vick was cleared to play and was set to start the game, and many chose the Eagles as favorites because of that. New York was coming into the game lo0king for revenge, after the Eagles comeback win in the Meadow Lands at the end of last season. That the Giants did, as New York put down a convincing win against the Eagles, winning the game 29-16. The highlight of the game for the Giants was knocking Vick out of the game with a broken hand in the mid fourth quarter, and forcing Mike Kafka to try and finish out the game. In my pre-game predictions, I took a shot in the dark and said that Vick would not be able to finish this game. It was not because I didn’t want to see him play and finish the game, it was that I thought the Eagles were rushing him back from his concussion the week before. Obviously, Vick breaking his hand has no correlation to the injury he sustained against the Falcons, but it fits the Vick stereotype. This will be the second straight season that Vick will miss extended time do to injury, and it was easy to predict an injury against a physical defense like the Giants. For Vick, it was the perfect storm, as the Eagles offensive line is inconsistent, and the Giants pass rush is relentless. The exact play on which Vick broke his hand is still unknown, and it may have happened when Giants defensive tackle Chris Canty bumped him to the ground. Considering how much in shambles the Giants receiving corps are, there is no reason Eli Manning should have been able to pass for a mind numbing 254 yards. To make things even worse — He threw an incredible four touchdowns. It makes me think that the Eagles secondary took the day off, and that Pro-Bowl corners Nnamdi Asomugha and Asante Samuel must have forgotten to set their alarms. The most alarming part of the whole situation is that Victor Cruz, the Giants second year receiver, caught three passes, two of which were touchdowns. On one of those touchdown catches, he was double covered by Asomugha and Jarrad Page. If I imagined one receiver ripping apart the Eagles secondary, (if they could have at all), it would have been Hakeem Nicks. The Eagles secondary was non-existent the entire game, and is a big problem. The Eagles promoted ex-offensive line coach Juan Castillo to defensive coordinator this off-season, and I think it confused most people. Trust me — It didn’t make any sense before, and is still doesn’t make any sense now. I think that the only reasonable explanation for the Eagles defense performing so poorly is Castillo’s play-calling. 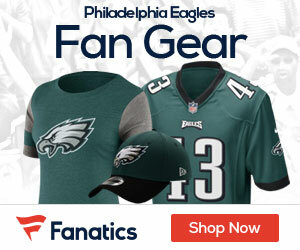 Because Philadelphia has the talent on the field, and what Manning and the Giants offense should not be possible. I am not saying that Sean McDermott would have been a better option, but thus far this season, Castillo is not proving his worth. Unless the Eagles defense has a massive turn-around, I don’t see Castillo keeping his job for much longer. After Vick left the game with a broken hand, the starting job was handed to Mike Kafka late in the fourth quarter for the second straight week. However, unlike the success Kafka had last week against the Falcons, he did not perform anywhere near as well against the Giants defense. On his first pass, he threw an easy interception to Giants corner Aaron Ross, when trying to hit a well covered DeSean Jackson deep. On the next drive, which was the Eagles last chance at getting back into the game, he was sacked, and then threw another interception over the middle to end the game. Andy Reid said that he never would have traded away Kevin Kolb if he didn’t believe in Kafka to fill in as a starter. Call that good faith for Reid — Or a flat out mistake. It really is too early to tell, and if Vick can’t play next week we’ll find out for sure. Earlier this week, the Eagles made the choice to bench rookie linebacker Casey Matthews in favor of Jamar Chaney as the starting middle linebacker. Considering how poorly Matthews played against the run in Philadelphia’s first two games, this seemed only to be a matter of time, and Chaney was the better option from the beginning. That showed immediately in this game, as Chaney was tied for the second most tackles on the team with four. Also, Ahmad Bradshaw was held to only 86 yards, which is a massive improvement from the Eagles last week. With all of the Giants backs totals, they only were able to gain 102 rushing yards and were unable to score on the ground. This reflects that Chaney is a totally solid bet as the starting middle, and Matthews should take a season to learn and develop behind him. This was a sweet victory for the Giants, and a totally bitter loss for the Eagles. The loss of Vick and the degree of his injury will be determined in the future, but this could have be a monumental game this season. This loss also places the Eagles at the bottom of the division, that is until either the Cowboys or Redskins lose on Monday Night Football. There is a laundry list of problems Philadelphia has to work on this week, and hopefully they will be ready to play the San Francisco 49ers. Eagles are in some deep trouble. I agree. There is a lot wrong, and not a lot of time to fix it. Hahaha! Dream team my foot! Trying to buy a super bowl….